I admit it has been a while, but welcome back to my patisserie challenge. My plan at the beginning of the year was to enjoy eating something different from our village boulangerie every Sunday and although Bernadette is still busy baking I have been a little slack in my eating, but I have a few reasons; firstly as it is only a small boulangerie there isn’t always something new for me to try and also we have quite an excess of eggs and fruit during the summer so I have been busy baking my own cakes, which once made need to be eaten. Imagine my excitement when I popped in today and not only found something I had yet to try, but something so very beautiful too. 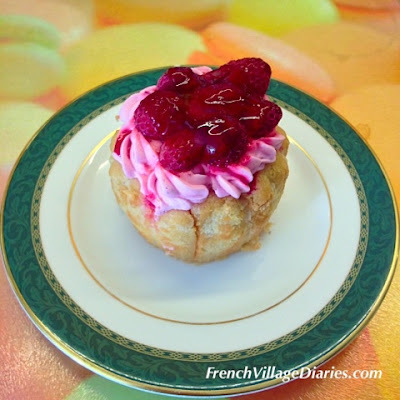 The patisserie in the spotlight today is the Charlotte aux Framboises and I have to say raspberries are one of my favourite fruits (that I’m still picking even now from the potager) so I couldn’t wait to tuck in. The outer sugar coating on the sponge fingers was crisp and crunchy, compared to the moist sponge inside that was infused with raspberry syrup. Contained within the spongy casing was a delicate pink raspberry mouse, with added whole raspberries that was light, creamy and delicious and topped off with a pile of fresh raspberries in a shining glaze. A perfect portion of raspberry perfection. Just for a minute I was a little girl once more, a pink-loving princess who had her cake and ate it. It was the perfect distraction in the middle of a busy Monday where tasks completed include a school run before sunrise, stripping the beds, entertaining sixteen 11 year olds while encouraging them to speak English, recycling, soup making, tomato roasting, dog walking and not forgetting the quarterly accounts with TVA return. Happy days.